Avi Loeb talks about his newest book, How Did the Stars and Galaxies Form? 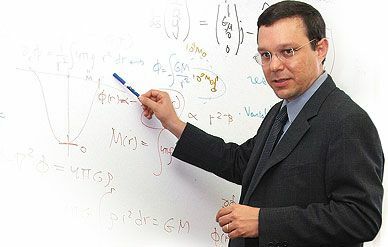 Abraham (Avi) Loeb is a professor of astronomy at the Harvard-Smithsonian Center for Astrophysics. Born in Israel in 1962, he is one of the pioneers in the field of early star and galaxy formation. His latest book, How Did the Stars and Galaxies Form?, was published this year by Princeton University Press. He spoke recently with Air & Space Editor Linda Shiner. Air & Space: What discoveries do you expect in the near future that will help explain the early history of the universe? Loeb: In the next five years, astronomers will try to detect the scars that the first galaxies left on the hydrogen gas surrounding them. When stars form, they produce ultraviolet radiation that can ionize, or break, the hydrogen atoms into their constituent electrons and protons. You end up with bubbles of ionized hydrogen surrounding galaxies and groups of galaxies. We haven’t yet seen the process during which the very first galaxies formed and produced these bubbles. That’s one of the exciting new frontiers in studies of the early history of our universe. The imaging technique of hydrogen resembles slicing Swiss cheese and finding the holes in it. A & S: Once we see this process, will that also explain why present-day galaxies like the Milky Way, look the way they do? Loeb: It will tell us how the process started. We’re basically looking at our origins. The early universe was not hospitable for life. Only after that first generation of stars fused hydrogen in their cores to make heavier elements like carbon, oxygen, and iron, could rocky planets like the Earth form and life begin. If we want to trace our origins—the scientific version of the story of Genesis—then we need to understand how the first stars formed and how they produced heavy elements. The first galaxies were the building blocks of the Milky Way, and the desire to understand them is a search for our roots. A & S: In your book you list cosmological milestones that occurred within fractions of seconds after inflation. The description is as assured as if it were an eyewitness account of these events. Is there already empirical evidence for them? Loeb: For some of these events, there is evidence beyond a reasonable doubt. For others, there is a question mark because we only have indirect evidence. A & S: In the absence of an empirical observation, how does the scientific community agree on what happened? Loeb: If there is no empirical data, then the community will never agree because there are always multiple options. People are not just convinced by theoretical arguments; they really need to see the evidence. It’s sort of like a detective story; unless you have the clues, the story will not be accepted in court. We have observed directly the cosmic microwave background—radiation that is a relic of the Big Bang, so we know that the Universe was denser and hotter in the past. But we haven’t yet figured out inflation, the fast expansion of the universe very early in its history from a space smaller than an atom to a cosmos 100,000,000,000,000,000,000,000 [100 sextillion] miles in diameter. Some people are still skeptical about inflation, but there is a whole community of people doing calculations that would help test the theory. A & S: What kind of observations could test that theory?